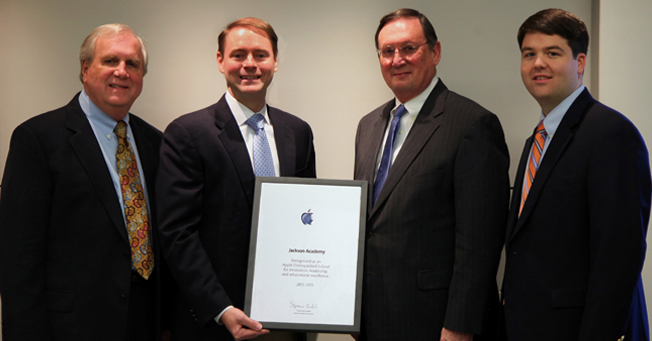 Jackson Academy Headmaster Pat Taylor, President-Elect Cliff Kling, President Peter Jernberg and Dean of Technology Eddie Wettach receive a plaque acknowledging JA’s selection as an Apple Distinguished School. Gov. 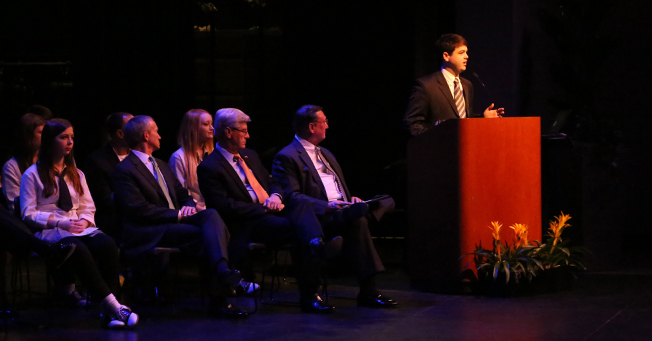 Phil Bryant spoke at Jackson Academy during the Apple Distinguished School program January 22 where JA was recognized as an exemplary learning environment. 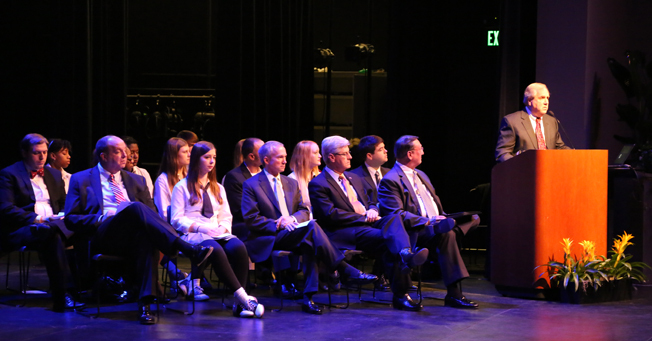 The Governor commented on the positive changes technology brings to education, while noting that teachers are fundamental to student success. 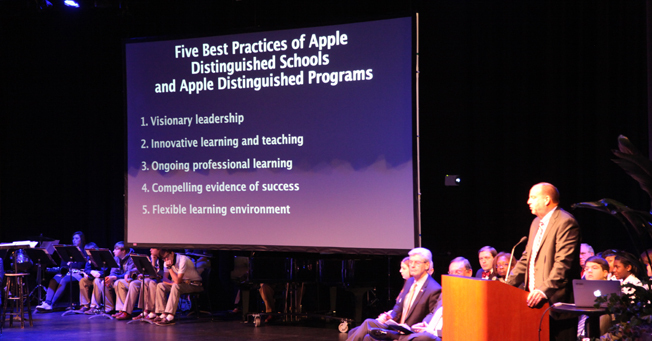 Apple Area Director Monte Rector describes the characteristics of schools selected for Apple Distinguished School designation. Rector is responsible for Apple's Education business in the Eastern 25 states. His teams focus on ways to use Apple tools to help transform the classroom from a content and pedagogical perspective, helping to drive increased student engagement and personal ownership of learning. Over the past 30 years Rector has worked with business and educational institutions across the United States, Europe, Middle East and Africa. 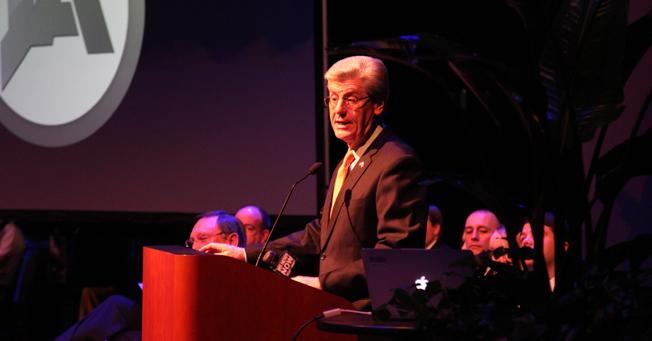 Jackson, Miss.—January 22, 2014— Mississippi Governor Phil Bryant spoke at Jackson Academy during the Apple Distinguished School program January 22 where JA was recognized as an exemplary learning environment. The Governor commented on the benefits technology brings to education and the role of teachers in student success. 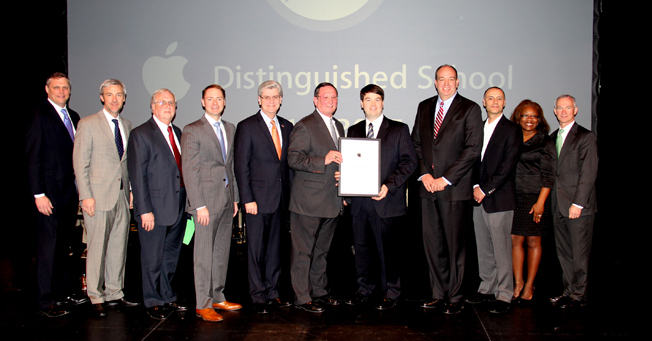 The ceremony was held to announce that Jackson Academy had been recognized as an Apple Distinguished School for 2013-2015 for its innovative use of technology in teaching and learning. 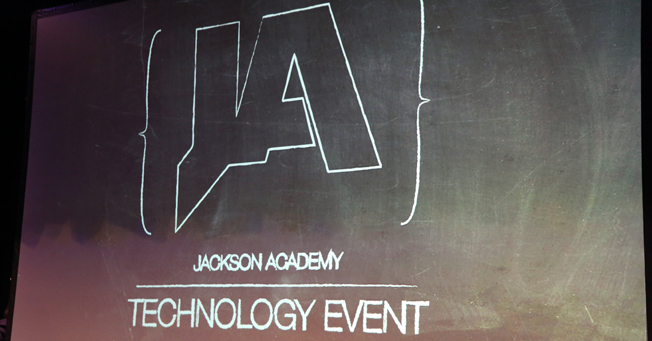 At Jackson Academy, each student, grades kindergarten through twelfth, has an Apple device (Macbook Air, iPad or iPod Touch) that empowers students and teachers to enhance learning. JA is among schools that have pioneered the adoption of this approach to learning and has assisted other schools in Mississippi and other states that are developing similar programs. 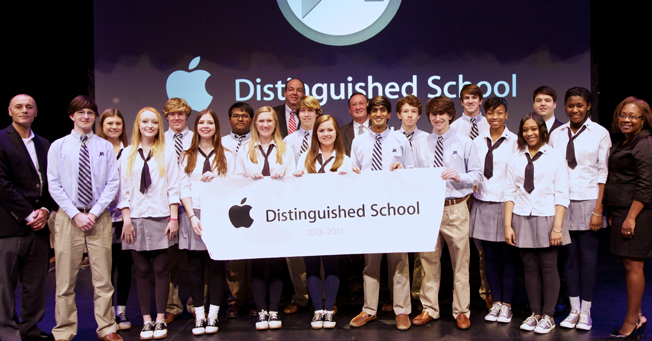 “The selection of Jackson Academy as an Apple Distinguished School highlights our success as an innovative and compelling learning environment that engages students and provides tangible evidence of academic accomplishment,” said Peter Jernberg, JA president. Teachers use technology to post lessons, assignments, and content to an online portal so that students, parents, and teachers can monitor student progress. They have begun implementing iPad technology instead of dedicated interactive boards for presenting content and they use video blogging to inform students about classroom information. Students use technology to express learning in ways other than the traditional paper and pencil, including creating a variety of media content, to better express mastery of topics. Students benefit from the use of online resources to expand research possibilities and collaborate with other students on assignments not only on campus but off campus as well. At the heart of Jackson Academy’s mission is a balanced, nurturing college-preparatory education for every student. The pursuit of 21st century readiness and innovation complements historically recognized educational principles and well-loved traditions. While JA retains a traditional curriculum focus, the school embraces an atmosphere of constant improvement to bring the best possible experiences to students. JA strives to be not just the leading independent school in Mississippi, but to be a national example for teaching and learning.